"When I decided to take GAMSAT, I was completely lost and did not know where should I start since I did not have a science background... I purchased the book that guided me around main topics and the HEAP book with 10 practise tests, I watched every single available webinar, I did live courses on campus, and used essay-correction services. I enjoyed listening to Dr Ferdinand because he does it with passion and a genuine desire to help students... I could not be more satisfied and confident with my preparation." Imperial College London and at St George's: It's time to get excited about learning again! The most practice questions (5000+), the most videos (300+), the most full-length mock exams (15+), and the most experience teaching GAMSAT courses in the UK, Ireland and Australia. GAMSAT Courses London by Gold Standard celebrates another successful year at the Huxley Building of the Imperial College London by expanding from 6 full days of class to 8 full days, with no tuition fee increases. Please note that our 2nd mock exam, which will be held on August 31st, will be at St George's, University of London. Now, in our 9th year, we offer you the opportunity to specifically address any area in your GAMSAT prep that requires improvement by attending one full day of our interactive GAMSAT courses for just £133, which includes course handouts. For the price of hiring a GAMSAT tutor, you can be taught by the author of the first GAMSAT textbook, ever. From our free monthly webinars to our extensive 70+-hour GAMSAT Video Library (included in our Complete Course below) to our unprecedented 80+-hours of class time for our live GAMSAT Courses in London, come learn from our experience. You can now choose a problem-based learning (PBL) GAMSAT course based on your needs, availability and budget. Payment plans are possible for the last 3 course packages in the table below and all 3 come with the Home Study Course which includes the Gold Standard GAMSAT textbooks, MP3s and more. 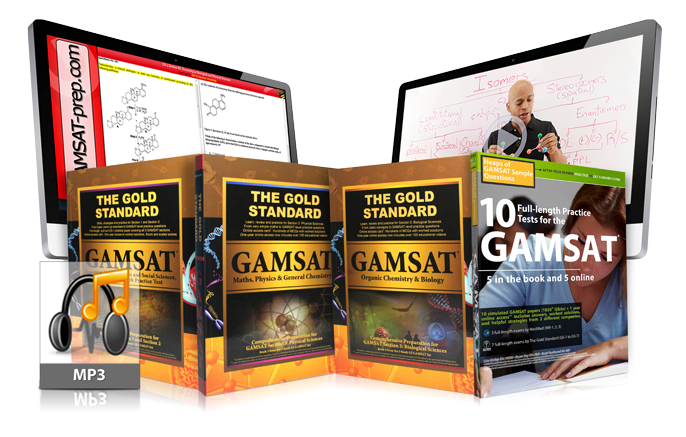 Both the Home Study Package and textbooks are also available separately should you wish to customise your own GAMSAT course. Join us to expand your knowledge, develop your reasoning, and to learn new GAMSAT strategies! The free GAMSAT Strategy Session is from 5:00 pm to 6:00 pm and is not obligatory if you are attending our Science Review days. All Science Review days are from 9 am to 6 pm; all Practice Test/Review days are from 9 am to 5 pm. Click any link below to reveal course details including daily schedules and the option to purchase. Meet weekly for 2 hours with a small group online with Dr. Ferdinand to focus on GAMSAT strategies and improving your weaknesses. 10 Tutorials: Keep on track with your study objectives. 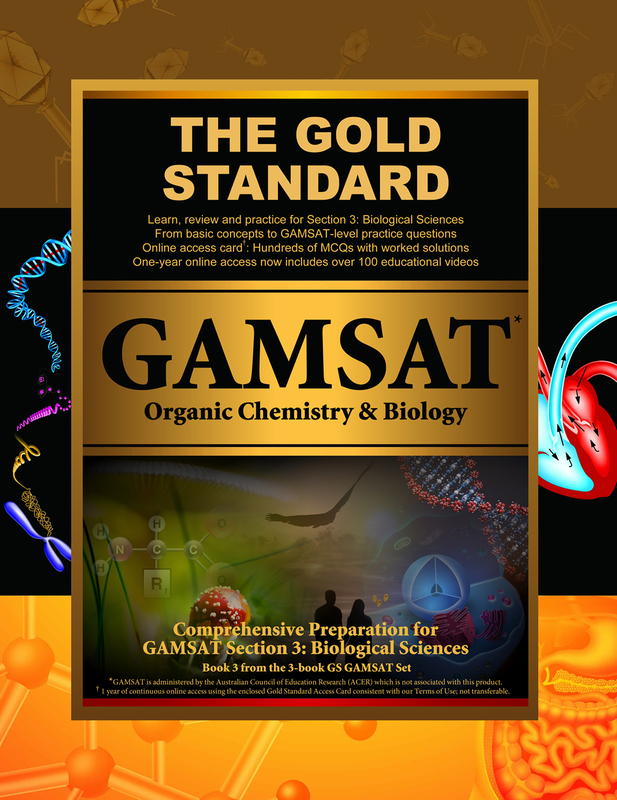 Gold Standard GAMSAT is coming to a campus near you! Dr. Brett Ferdinand will be holding a free GAMSAT problem-based learning session (approximately 1 hour) at Imperial College London, August 19, 2018 at 5:00 pm. Get a chance to share your preparation experience and concerns with fellow GAMSAT candidates! Book now so we can reserve your seat and your free handout. At no extra charge, we are adding 1 bonus day to our GAMSAT course to permit students to work on areas of weakness prior to the practice exam. Dr. Ferdinand will be available all day to answer questions attendees may have. You can choose to study content from the first 2 days, or review your own notes/materials, or try some additional handouts which will be available in class covering all 3 sections of the exam. Attendance is optional. Our Gold Standard GAMSAT Courses schedules are likely outlines of our courses but may be somewhat modified without notification depending on class size and need, as well as any suggested or announced changes to the real GAMSAT. We prioritise preparing students for the real exam rather than teaching topics which are no longer relevant. The following topic list or syllabus is not meant to be exhaustive nor definitive. Consider it a guideline for topics that we are expected to cover as a result of the stimulus materials reviewed in class. BIOLOGY - The Eukaryotic Cell, Plasma Membrane, The Cell's Interior, DNA, The Cell Cycle, Protein Synthesis, Viruses, Prokaryotes vs. Eukaryotes, Bioenergetics, The Neuron, The Nervous System, The Endocrine System, The Circulatory System, Blood Composition, Lymphatic and Immune Systems, The Digestive System, The Excretory System, Gametogenesis (Meiosis), Genetics. Please, email your inquiries to learn@gold-standard.com. Our advisors will respond within 1 business day. Alternatively, you may call 020 3286 6443. Contact reservations department on reservations@imperial.ac.uk who will be able to check availability in halls of residence and local hotels. Students can purchase lunch at the campus cafeteria. There will be no refreshments provided in class so please consider packing snacks and/or a lunch. Bonus: Free Wednesday study session. At no extra charge, we are adding 1 bonus day to our GAMSAT course to permit students to work on areas of weakness prior to the practice exam. Dr. Ferdinand will be available all day to answer questions attendees may have. You can choose to study content from the first 2 days, or review your own notes/materials, or try some additional handouts which will be available in class covering all 3 sections of the exam. Attendance is optional. *Last minute registrants should arrive at least 15 minutes before class begins with payments in the form of cash only. Please bring your ACER GAMSAT practice booklets (or e-book access with your electronic device or print-out) so that if time is left at the end, worked solutions can be presented in class. Our GAMSAT courses in London hold no affiliation nor have we sought nor received endorsements from Imperial College London. Dr. Ferdinand will hold small group tutorials either before class or during lunch, or after class, so that he can be available for further discussions. On the morning of the first day, students will be assigned to which small group they would belong. Printing of practice problem sets is included in the course tuition. After the mock exam, all students will be provided with online access to worked solutions to every practice question in their mock exam (GS-6). Bonus Wednesday study session: At no extra charge, we are adding 1 bonus day to our GAMSAT course to permit students to work on areas of weakness prior to the practice exam. Besides the course schedule, Dr. Ferdinand will hold small group tutorials either before class or during lunch, or after class, so that he can be available for further discussions. On the morning of the first day, students will be assigned to which small group they would belong. Printing of the full-length practice test GS-5 (AKA HEAPS-5, the fifth exam in our new 10 Full-length Mock Exam book) is included in the course tuition. Contact Marc Livingstone on mlivings@sgul.ac.uk who will be able to check availability in halls of residence and local hotels. Alternatively, you could try the Pelican Hotel and Residence—they’re based on the hospital/university site and specialise in short term accommodation. The website is www.pelican-london.com. *Last minute registrants should arrive at least 15 minutes before class begins with payments in the form of cash only. Please bring your ACER GAMSAT practice booklets (or e-book access with your electronic device or print-out) so that if time is left at the end, worked solutions can be presented in class. Our GAMSAT courses in London hold no affiliation nor have we sought nor received endorsements from Imperial St George's. 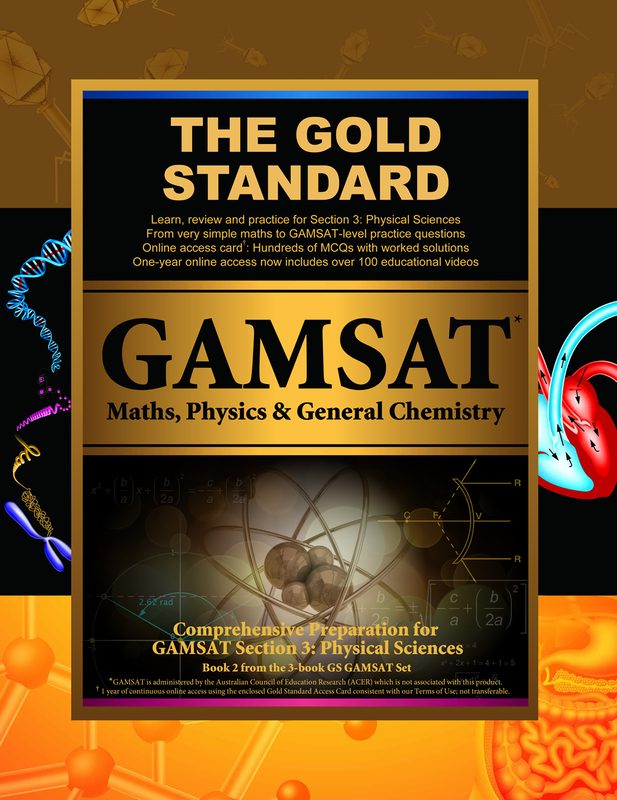 For students purchasing the Live GAMSAT Science Review Course (£299), Practice Test + Review Course (£299), GAMSAT Home Study Package (£340) and 8 GAMSAT Essay Correction Service (£149) at the same time, you can have this complete GAMSAT course preparation at a discounted rate of £899 (approx. £190 off). Postage of the Home Study Package is free for Ireland and the UK. You will receive your Home Study Package within a few days of payment while online access is instant which includes your essay-writing schedule and unlimited access to our Video Library within your 1-year access period. Online access begins instantly after payment and continues through the next two possible sittings of the GAMSAT in the UK. For 6 full days, join us to expand your knowledge, develop your reasoning, and learn new strategies. 12 full-length GAMSAT practice tests including the ‘Heaps’ book (5 exams exclusively online and 5 different, printed papers in the book) + 2 full-length ‘greatest hits’ practice papers proctored on campus (Virtual Reality GAMSATs VR-1 and VR-2) + GS-Free online (an abbreviated, prognostic exam); note that this represents far more than what is offered by any other GAMSAT prep course in Australia - ever. You will receive online access immediately after payment which includes your essay-writing schedule and access to our Gold Standard Video Library with over 300 videos. Thereafter, you will receive the Home Study component of your course materials within a few days. You can also choose to attend the 6 full days of Live Courses within 2 years of your purchase. Only if you cannot attend class in person but can provide us with at least one week’s notice, you have the option of watching the class live (online) or you can watch a recorded version which you would have access to until the next sitting of the GAMSAT. Payment plans are possible (see Contact Information). Online access begins instantly after payment and continues for one full year. Dispatch from London. This course also comes with a GAMSAT Score Guarantee: get the score you want or repeat online access for free (up to 1 additional year of access). Your Guarantee also permits you to complete your 16 essays within 2 years if needed. Handouts are included in course tuition. Note: if you intend to purchase 5 or more days, it may be more economical to purchase our 7 or 8-day GS GAMSAT Course. BRAND NEW: Virtual Reality GAMSAT exams VR-1 and VR-2 constructed to develop your exam-level reasoning and strategies directed to recently trending GAMSAT topics. Note: ALL students will receive online access to worked solutions to each and every question after sitting this mock exam. NEW: The 2 essays will be scored and returned to you within 1 week with helpful, constructive advice. BRAND NEW: Virtual Reality GAMSAT exam VR-2 constructed to develop your exam-level reasoning and strategies directed to recently trending GAMSAT topics. Note: ALL students will receive online access to worked solutions to each and every question after sitting the mock exam. The 2 essays will be scored and returned to you within 1 week with helpful, constructive advice. If you wish to purchase any of the 3 paperback Gold Standard textbooks or the 10-exam Heaps book individually or as a package, either close this window and scroll to the bottom of the webpage for fast delivery, or purchase fromany participating bookshop. Come learn from our experience. VR-1 is followed by 2 full days of deconstruction, strategies and PBL. VR-2 is followed by online access to answers, helpful worked solutions including Section 3 background videos where applicable. 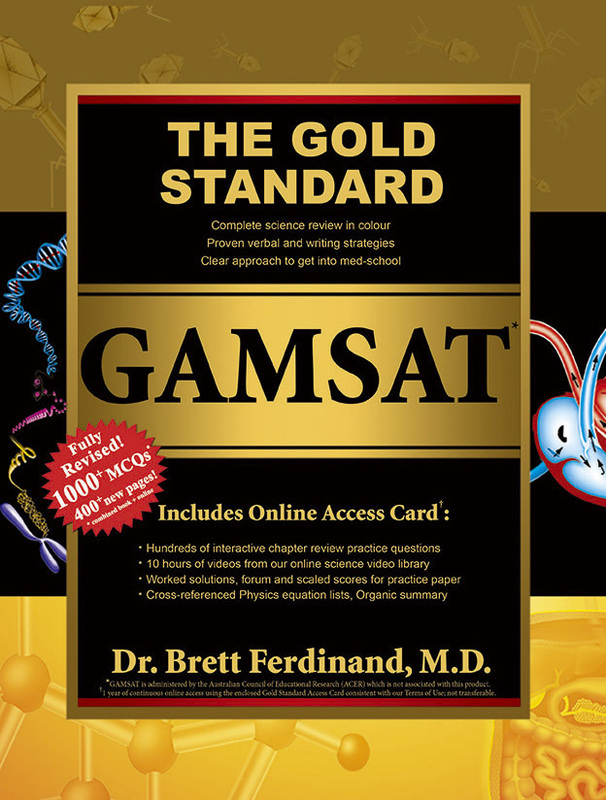 Our GAMSAT courses are taught by Dr. B. Ferdinand who is the author of the first GAMSAT textbook ever written, the Gold Standard GAMSAT; has 9 years of experience teaching GAMSAT courses; and he produced more than 100 GAMSAT YouTube videos with step-by-step worked solutions for the official GAMSAT practice materials (published by ACER). Dr. Ferdinand is known as a dynamic lecturer who makes difficult concepts easier to understand. You can watch clips from his free lecture at the University of Sydney preparing students for the medical school interview. Join us for problem-based learning with an experienced GAMSAT expert. Bonus: Free Wednesday study session (August 22). At no extra charge, we are adding 1 bonus day to our GAMSAT course to permit students to work on areas of weakness prior to the practice exam. Besides our GAMSAT course syllabus and schedule, Dr. Ferdinand will hold small group tutorials either before class or during lunch, or after class, so that he can be available for further discussions. On the morning of the first day, students will be assigned to which small group they would belong. Printing of practice problem sets is included in the course tuition. The following topic list or syllabus is not meant to be exhaustive nor definitive. Consider it a guideline for topics that we are expected to cover as a result of the stimulus materials reviewed in class. Also note that an essential GAMSAT skill is the analysis and interpretation of graphs, diagrams and tables, which is an integral part of our GAMSAT courses and videos. Some companies photocopy PowerPoint slides from class, and non-GAMSAT specific Wikipedia images and articles, bind it together and call that a course textbook. We are the first and only company to produce a professional, colour, hardcover textbook which has won an International Book Prize and has helped thousands of students gain admissions to medicine. You do not have to take our word about the quality that we offer, you can browse through the book yourself at your local uni bookshop, or look at some sample pages by clicking on the front covers of the books below. We have been a leader in GAMSAT preparation for years. We offer four times more online videos (currently: 300+), twice the number of practice tests (currently: 15), and far more practice questions (5000+) than any of our closest ‘competitors’. We continue to be the only company to offer iPhone and Android apps, and MP3s – all of which are included in our Complete Course Packages (also available separately). 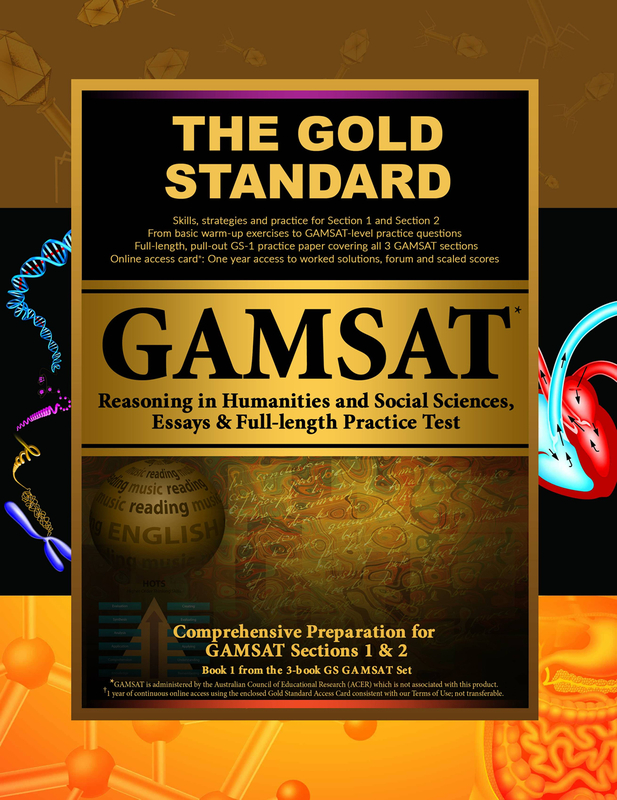 You will be taught by the author of the Gold Standard GAMSAT textbook which is a level of experience unmatched. You can even sample his teaching style on YouTube, Vimeo, or GAMSAT-prep.com prior to class which is also unprecedented. All students are also welcome to further experience our teaching methods by joining our popular and free monthly GAMSAT webinars. Real paperback books for the real paper-based GAMSAT. Also available at participating bookshops. Over 3000 practice questions available in the book and online using the GS Online Access Card with Personal Identification Number (PIN). 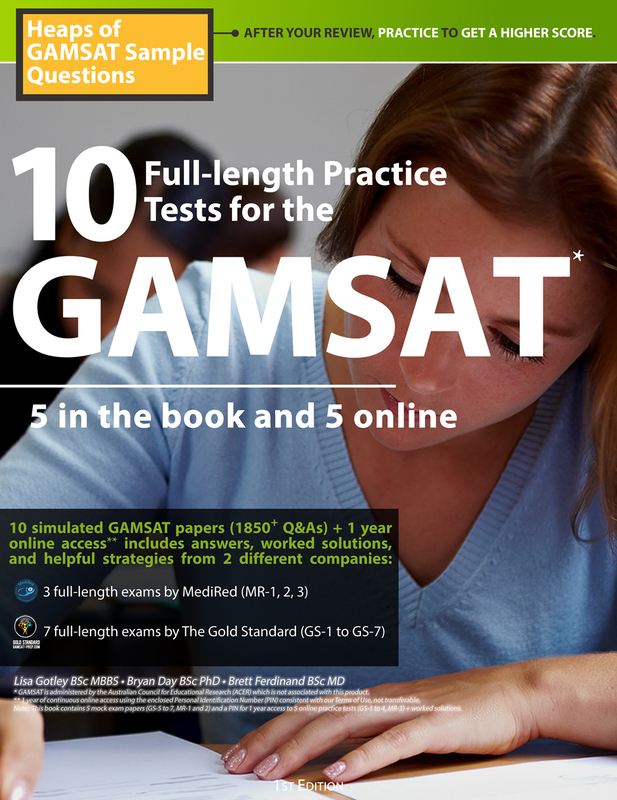 10 full-length GAMSAT practice tests with scaled scores and worked answers. Unlimited access to our 300+ video library for 1 full year using your PIN. You will have access to more than 300 online videos with unlimited viewing within your access period. The ADD TO CART button(s) permit you to pay using any major credit card, echeck from a bank account or payment from your Paypal account. Paypal also offers payment plans. Please Note: You do NOT require a Paypal account to use the Add to Cart buttons. You will have 2 options to CHECKOUT. You can simply choose the CHECKOUT button that does NOT show Paypal and then you will be given the option to Checkout using a credit card or debit card. If you do not wish to use Paypal as a 3rd party processor of your payment, you have other options: if you wish to pay by phone, money order, certified cheque or bank transfer, please email us to receive further instructions: learn@gold-standard.com. To pay securely with any major credit card from any country without Paypal, please click here: secure credit card payments. Simply enter the total price (convert to USD) and item(s) description. Item ID and Client ID numbers are not necessary. All items are dispatched from London. If you wish to pay in EUR, USD or AUD, then click on one of the following links, respectively: GAMSAT Ireland, GAMSAT Preparation, GAMSAT Australia. Learn proven GAMSAT strategies with an expert! March 3, 2019 (Sunday) at 7 am GMT. Thank you for your interest in registering for the Free GAMSAT Problem-based Webinar. An email will be sent to you shortly with the class details and link to the virtual classroom. You can share this link with your fellow GAMSAT candidates.